This is essentially a dairy unit i.e. cows producing milk with their calves being raised for meat or milk production. A cow must have a calf every year if she is to continue producing milk. Peter currently milks about 200 cows twice a day. In total there are around 350 cattle – cows, calves, heifers (teenagers) and bullocks, here or at Chapmans Hill Farm. Many of the calves live in special calf hutches. The dairy cows are mainly black and white Holstein Friesians with about 3 brown & white Dairy Shorthorns. They are identified by ear tags and numbers branded on their rump to identify them in the parlour. Most of the cows are artificially inseminated (AI) to continue breeding pedigree animals. Crossbreed and male calves are sold to Peters brother or other local farmers to be raised as beef animals. The cattle are housed indoors during the winter months, and the majority are then let out to graze in the Spring and Summer months. A 3rd cattle shed was built at the side of the large shed during Summer 2018 .This is now going to be used for housing livestock and straw. The herringbone milking parlour holds 30 cows at a time with 15 on each side. Peter , Dave or Emma milk from 4.30am and work alternate weekends. While Peter ,Dave or Emma milk again from 3.00pm. It takes around 3.5 hours to milk all the cows plus 30 minutes to clear up and take buckets of milk to feed the young calves. 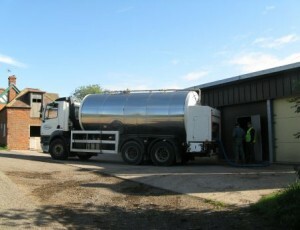 About 4000 litres of milk are collected every day by Arla Foods. 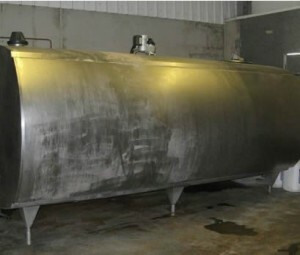 The vat (milk tank) holds 7,500 litres. The milk must be stored at less than 4 degrees Celsius. Peter receives about 28p base price for each litre of milk. (Less than a quarter of the end product price for milk comes back to the farm). 6 tame ewes and are kept for the children to feed and observe. Lambing time should be in March and the sheep are sheared in June or July, Their wool normally goes for sale through the Wool Marketing Board. All but 1 of the 2018 lambs have been sold for meat. The increased size of the dairy herd also meant that there are no buildings in which to house a large flock during lambing time. Peterhas built a lambing and winter shelter for the school sheep behind the pig sty as our winters seem to be getting wetter and more severe. 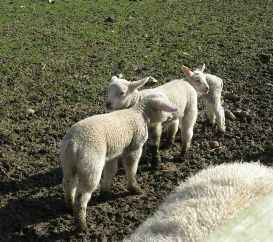 The sheep have their own paddock by the reed beds and also have access around the back of the classroom. 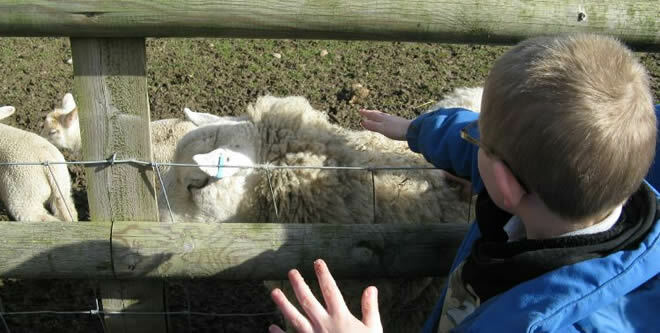 The children can feed the sheep safely without entering the field, whilst standing on a hard surface area. 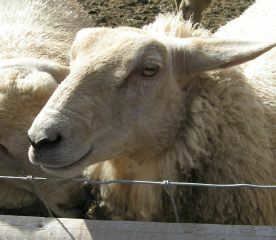 Our sheep are a wonderful example of Herbivores i.e. animals who do not have canine teeth and must have a vegetarian diet. We have 2 cross breed female pigs (sows) who live in a purpose built sty close to the classroom. 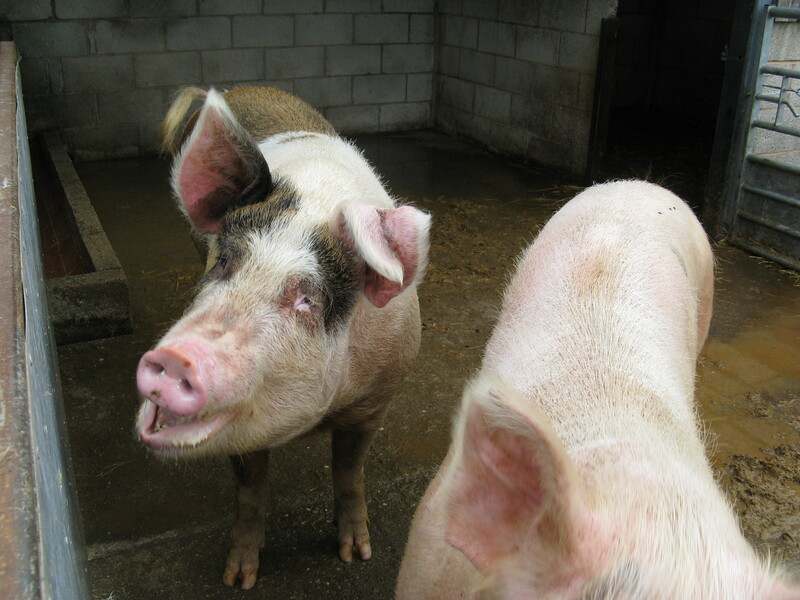 Pinky (above) has a Gloucester Old Spot mother (sow) and a Large White father (boar) which is a typical commercial breed usually kept for pork. Perky (below) is mainly a Duroc pig from Eastern Europe with a much thicker coat of bristles, able to withstand both our cold winters and hot summer days. The pigs are kept purely for educational purposes so that the children can meet real full-size pigs and they will not be slaughtered for meat. 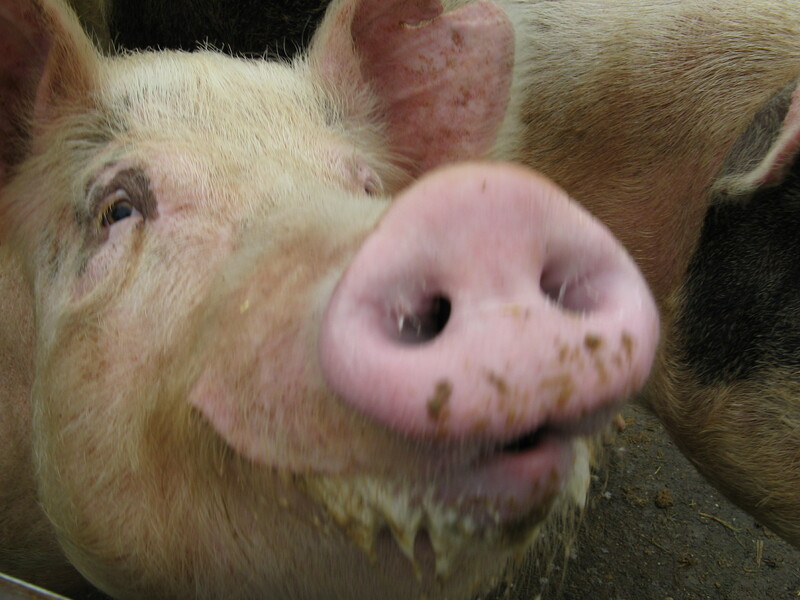 The children can see, but not feed them as pigs have up to 44 teeth! Viewing the pigs is optional. If visitors prefer not to meet Pinky and Perky in their sty this will be respected. 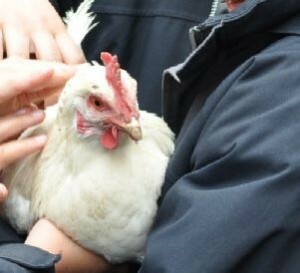 The children’s first activity is to feed and collect the eggs from two pens of hens. New hen houses were built following the Chapmans Hill designs. 25 or so free range birds lay from the spring through until the autumn. Each pen has a cockerel so the eggs should be fertile and could be hatched out as chicks. 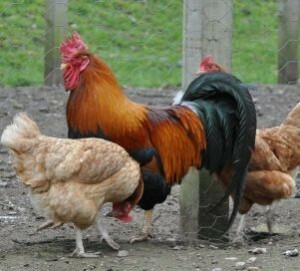 We keep some brown hens (derived from the Rhode Island Red) but also have a range of other good egg-laying breeds, including White Leghorns. The children can then observe their colours and characteristics. In winter the decreasing light levels and cold weather tend to stop the older birds from laying so we buy in some young pullets and egg production increases significantly after February. However a hen can only produce a maximum of one egg per day.